The Willard Intercontinental isn’t just an iconic Washington landmark, it’s also one of the most eco-friendly hotels in the city. Now, in addition to leading the way in green meetings, being the first hotel in the city to be 100% windpowered, and engaging in a variety of award-winning sustainability practices, the Willard Complex is going green for the holidays. The Willard Complex, which includes the Willard InterContinental Hotel, the Occidental Restaurant, Cafe du Parc, the Willard Office building, and an elegant courtyard, has decked its outdoor trees within the complex and on Pennsylvania Avenue with 20,000 LED lights. The decorative LEDs used to outfit the trees will twinkle along Pennsylvania Avenue from 14th to 15th Streets and on the courtyard trees and wreaths. 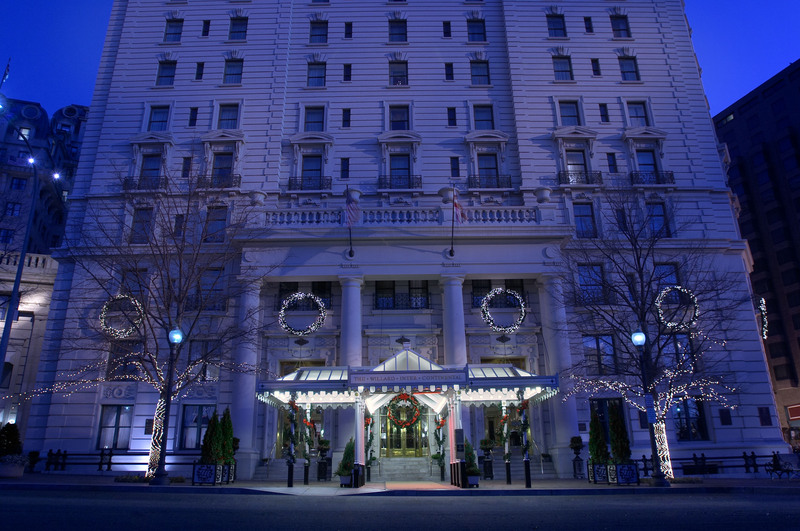 The Willard’s use of the LED lights instead of conventional lighting has given the complex management a special opportunity to conserve energy and reduce waste during the holiday season. Using LEDs reduces energy consumption by 80%, the bulbs have a long life span and emit a cooler light than traditional holiday lights, and they are generally more safe and cost effective.